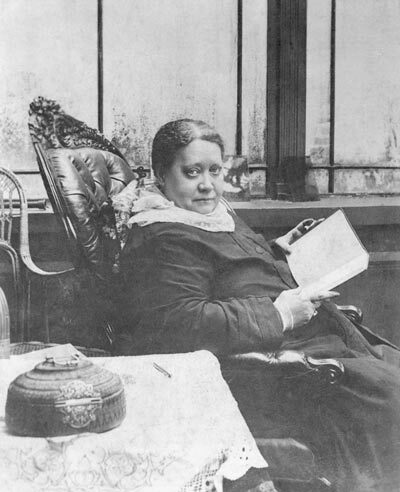 There can be no separation between the writings of H. P. Blavatsky and the growth in comprehension of the work of The Theosophical Society by its adherents. As the first teachings of the ancient wisdom — barely sketched in HPB's earliest major work, Isis Unveiled — were assimilated, a natural demand was made for a more complete exposition of the philosophy. Likewise the Society's objectives and principles, as enunciated from time to time, became more defined and inclusive of the work envisioned for the Society by those responsible for its beginnings. The true founders of the TS were HPB's teachers, and it was in large measure from them that the subject matter in Isis Unveiled and The Secret Doctrine was called forth. In their efforts not to cause more publicity and expose the names of the Mahatmas to public eye, Olcott and the TS Council at Adyar left HPB undefended, and thus by their silence virtually implied her guilt. HPB strenuously objected; the honor of the Society and of her teachers was at stake. She had wished to go to court in order to vindicate her teachers and the work they had sent her to do. But Olcott threatened HPB with his resignation if she did not abide by the decision of the Special Judicial Committee. (4) Eventually her already poor health broke down. On March 21 HPB tendered her resignation as Corresponding Secretary, and on the 31st on doctor's orders she left India, hopefully to recover sufficiently to finish her Secret Doctrine. 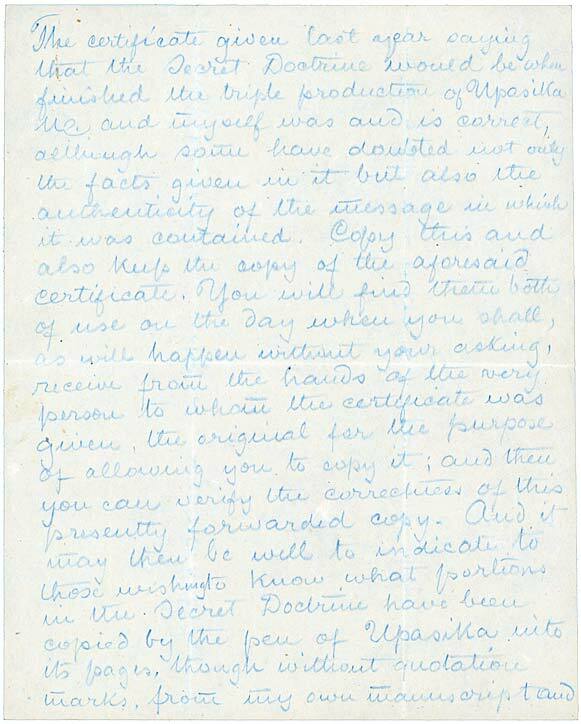 As she was boarding the steamer, Subba Row asked HPB to continue writing and send him through Olcott every week what she had written, as he would then "make notes and commentaries" (The Theosophist, March 1925, 784). Even on the open sea, she received "pages of manuscript referring to The Secret Doctrine." (5) She stayed about three months in Italy, at Torre del Greco and Rome, and later in Switzerland, finally settling at Wurzburg, Germany in early August. On October 28, 1885, HPB wrote Olcott that she had "not much time now . . . but shall in a month or two send you the first six sections." (ODL 3:317). In Old Diary Leaves (3:385), Olcott writes that the SD manuscript of Volume I arrived in December 1886, but that Subba Row would not work on it as originally agreed upon because, as he said, there were so many errors he would have to rewrite it. HPB, much distressed, carefully went over the material again making many corrections. In England at this time, a number of members of Sinnett's London Lodge were not satisfied with the existing state of affairs. They felt that a new impulse was needed for public work (7), and they decided to write HPB individually about the problem. Each received a long letter in return in which, among other things, she explained the urgency for her to finish The Secret Doctrine before taking up other activities. Nevertheless, early in 1887 Bertram Keightley went to Ostende to see HPB, who asked him "to look over parts of the MSS." She agreed to come to London at the end of April, provided lodging and other matters could be arranged. 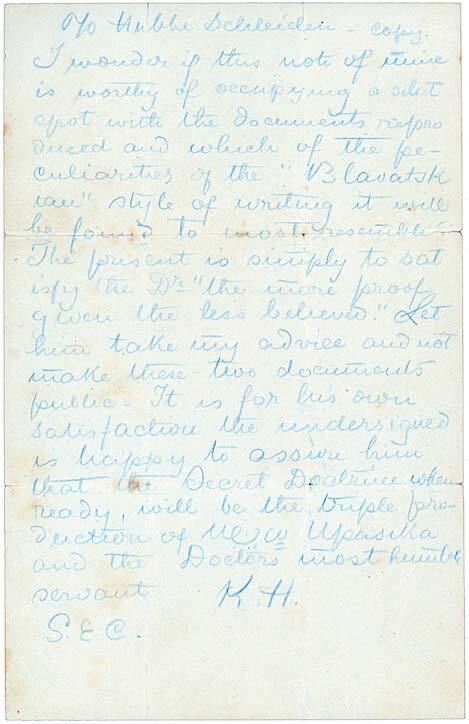 Soon after, Dr. Archibald Keightley (8) went to Ostende to visit HPB, who likewise gave him some of the SD to read. But hardly had he returned to England when news came of HPB's grave illness. Her physician and friends thought this time she would surely die but, as she had done in India in February 1885, she again miraculously recovered. Almost immediately thereafter she announced that the next phase of her work was to be carried on in England, both as regards The Secret Doctrine and the Theosophical Society. Learning of this, the Keightleys went to Ostende in the last weeks of April to prepare for the move. She was to stay at the small home of Mrs. Mabel Cook (Mabel Collins), Maycot, Upper Norwood, London. Maycot, Crownhill. Upper Norwood. London C.S. May 7th. As soon as possible she was at her desk and work went on as usual. The task of readying the SD for publication fell mainly to the Keightleys. Bertram Keightley wrote that on arriving in England HPB asked them what they wished to do and after hearing their replies remarked, "All right, then, . . . here you are — get to work right away" (BK, Reminiscences, 7). With that she gave them the entire manuscript to go through and advise her about arranging it. It made a pile over three feet high and was, as Archibald Keightley relates, "in detached sections, . . . with no definite arrangement, much of which had been patiently and industriously copied by the Countess Wachtmeister." After prolonged consultations the plan submitted to HPB became the present division of the volumes and contents. Other material having no place in the order and plan was to be saved for the future. They worked through the summer "reading, re-reading, copying, and correcting." (9) There were many quotations to be verified at the British Museum or wherever else they might be located. H.P.B is fairly well & working away right hard at the Secret Doctrine; which is awfully good & I am sure you will be immensely pleased with it. Tho' I date this from Linden Gardens, I am staying with HPB at Maycot, Crown Hill, Upper Norwood. S.E where I expect she will be for the next two or three months. We have got a scheme on foot for establishing HPB in winter quarters near London where she can live in peace & gather the real workers in the Society around her. But whether it will succeed or even ever be really begun I cannot tell. All I know is that we shall do our level best to bring it about. Still do not mention anything about it; as "there's many a slip twixt the cup & the lip" & these things are best kept quiet till actually done. Anyway we mean a real effort to put new life into this dull L.L. [London Lodge] & the new Magazine, is the first step. The title at present in favour is "Lucifer: the Lightbearer," but no final decision has yet been come to. At any rate we mean to do two things: to make HPB as comfortable as we can & to prove to her that there are some at least who really appreciate her ceaseless self sacrifice & untiring exertions for the Cause. — Archives, TS, Pasadena. HPB had long been disappointed with her financial arrangements with J. W. Bouton of New York for the publication of Isis Unveiled and, in consequence, she was determined to have financial control of The Secret Doctrine in both the United States and England. In May 1888 she asked W. Q. Judge to secure copyright in her name in the United States for her book, and to publish it in the U.S. either from "stereo plates, or only the moulds" sent from England. (10) Judge, after consultation with J. W. Lovell (of John W. Lovell Co. of New York), wrote Bert Keightley that the best method to follow for 1,000 sheets or more was for London to ship printed sheets, to be folded, collated, and bound in the U.S. (11) Copyright could be obtained in HPB's name as she was an American citizen, if all particulars about the book were furnished as requested. However, HPB was to understand "that the emission of the American and English editions should be simultaneous." (12) After delays in England the sheets for 1,000 copies of the first volume of the SD arrived in New York City on the steamer Britannia, Friday, October 19th. Judge wrote that the deadline of October 27th for "publishing" probably could not be met by him. (13) Finally, on October 31st HPB cabled Judge asking "Have you published?" Judge cabled back "Yes, Book Out Nov 1." (Archives, TS, Pasadena) Volume II was published December 28th. I have also noted, your thoughts about the "Secret Doctrine". Be assured that what she has not annotated from scientific and other works, we have given or suggested to her. Every mistake or erroneous notion, corrected and explained by her from the works of other theosophists was corrected by me, or under my instruction. It is a more valuable work than its predecessor [Isis], an epitome of occult truths that will make it a source of information and instruction for the earnest student for long years to come. — Letters from the Masters of the Wisdom, No. 19, I:47, 5th ed. The co-authorship of The Secret Doctrine is also made plain in joint letters from the Mahatmas M and KH to Dr. Hubbe-Schleiden, received by him in Germany in early January 1886. 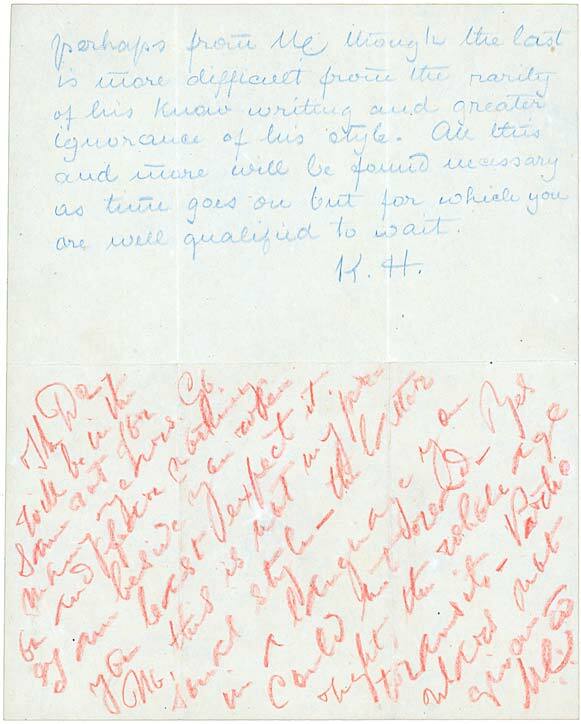 Copies of these letters in Masters' handwriting were sent by HPB to Judge in America for his future use. He printed them with explanations in the April 1893 issue of The Path. The letters are reproduced on the following pages. As the last sentences of Volume II indicate, HPB had two further volumes in preparation to be issued if the reception of the first volumes warranted it. These were never published and one can only surmise that more time was needed to comprehend the material already given out. She did, however, produce The Voice of the Silence, a small book of precepts drawn from "the same series as that from which the 'Stanzas' of the Book of Dzyan were taken, on which the Secret Doctrine is based." These present a noble conduct of life for those who would make themselves of greater service to mankind, and it was hoped that perhaps some few might find access to that inner knowledge to which she had pointed the way. As to Volumes III and IV, who is to say they will ever be issued. Today, a century after the publication of The Secret Doctrine, other egos are creating a new world. The teachings they call forth for the next century will be in answer to their karma and the karma of their times. If HPB's writings have produced any effect, it may be found in the deeper spiritual yearning among an ever greater number to bring about the Universal Brotherhood for which she so labored and sacrificed. The following letters regarding the "triple" authorship of The Secret Doctrine were written by the Mahatmas M and KH. These facsimile reproductions are made from originals in the Archives of the Theosophical Society, Pasadena. 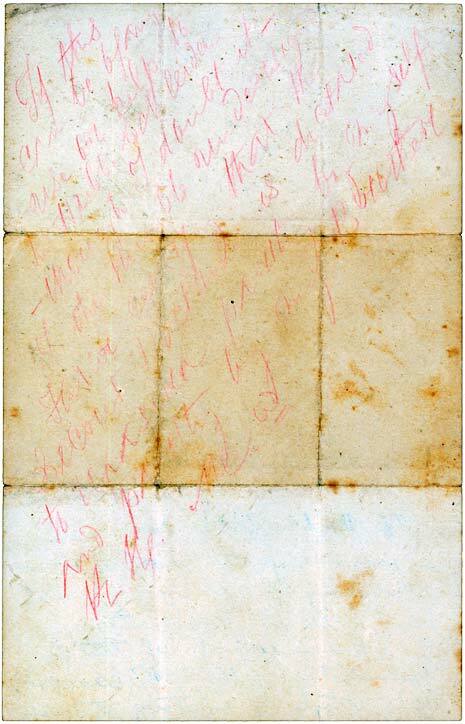 Letter One is a copy made by the Mahatmas of their original messages to Dr. Hubbe-Schleiden of Germany. Upasika stands for HPB. To Hubbe Schleiden — copy. I wonder if this note of mine is worthy of occupying a select spot with the documents reproduced and which of the peculiarities of the "Blavatskian" style of writing it will be found to most resemble? The present is simply to satisfy the Dr "the more proof given the less believed." Let him take my advice and not make these two documents public. It is for his own satisfaction the undersigned is happy to assure him that the Secret Doctrine when ready, will be the triple production of M \. Upasika and the Doctors most humble servant. If this can be of any use or help to Dr. Hubbe Schleiden — though I doubt it — I the humble undersigned Fakir certify that the Secret Doctrine is dictated to Upasika partly by myself and partly by my Brother K. H.
The certificate given last year saying that the Secret Doctrine would be when finished the triple production of Upasika M\and myself was and is correct, although some have doubted not only the facts given in it but also the authenticity of the message in which it was contained. Copy this and also keep the copy of the aforesaid certificate. You will find them both of use on the day when you shall, as will happen without your asking, receive from the hands of the very person to whom the certificate was given, the original for the purpose of allowing you to copy it (14); and then you can verify the correctness of this presently forwarded copy. And it may then be well to indicate to those wishing to know what portions in the Secret Doctrine have been copied by the pen of Upasika into its pages, though without quotation marks, from my own manuscript and perhaps from M\ though the last is more difficult from the rarity of his know(n) writing and greater ignorance of his style. All this and more will be found necessary as time goes on but for which you are well qualified to wait.